There are not many reliable stock market indicators out there. Some work some of the time. There is one however that has a far more reliable history: the interest rate inversion. Part of the reason that an inversion is such a strong signal is that when bank assets (longer-duration loans) generate less income than bank liabilities (short-term deposits), the incentive to make new loans dries up along with the money supply. And when asset bubbles are starved of that monetary fuel they burst. The severity of the recession depends on the intensity of the asset bubbles in existence prior to the inversion. So the yield curve has not yet inverted, but it increasingly looks as if it will in the near future. Are assets, stocks, overvalued? Not the easiest question to answer as there are so many different valuation methods that one can use. My money would be on a drawdown though. Markets don’t move in only one direction forever. They may move far further, for far longer than any rational explanation can explain, but at some point the ride is over. The good thing about an inversion signal is that it generally gives you advance warning and time to act. Just one more post about yield curves – I promise! With Friday’s release of the CFTC commitment of traders report, I couldn’t resist. In the coming years, I believe the yield curve steepener has the potential to be one of the all-time great trades. Eventually, I think the Fed, along with all the other developed countries’ Central Banks, will lose control of the long end, and yield curves throughout the world will explode to record wides. As I discussed previously, I am not sure about the long-term timing. 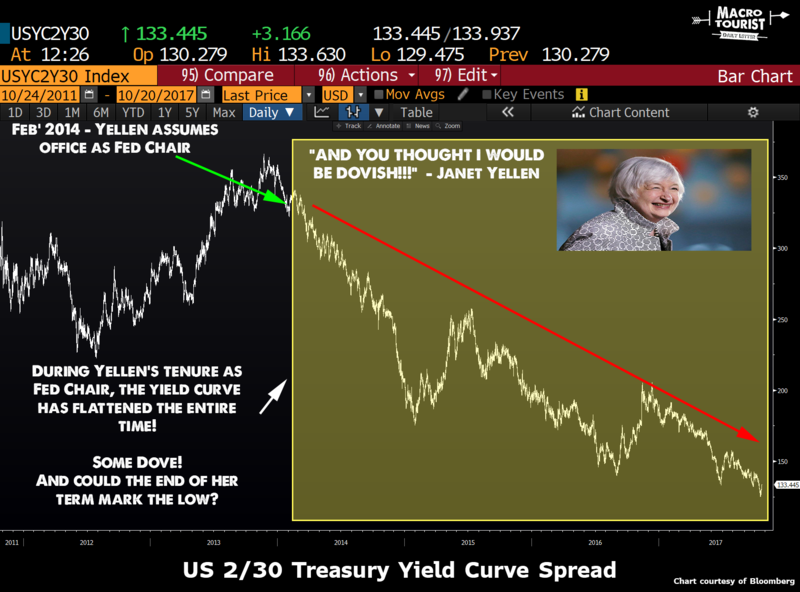 Will the Fed invert the curve? Or does the new post-GFC environment throw all those old playbooks out the window? I am still trying to decide about my long-term positioning, but I am increasingly confident, from a short-term trading perspective, the 5-30 steepener trade is a screaming buy. Why do I feel so strongly? 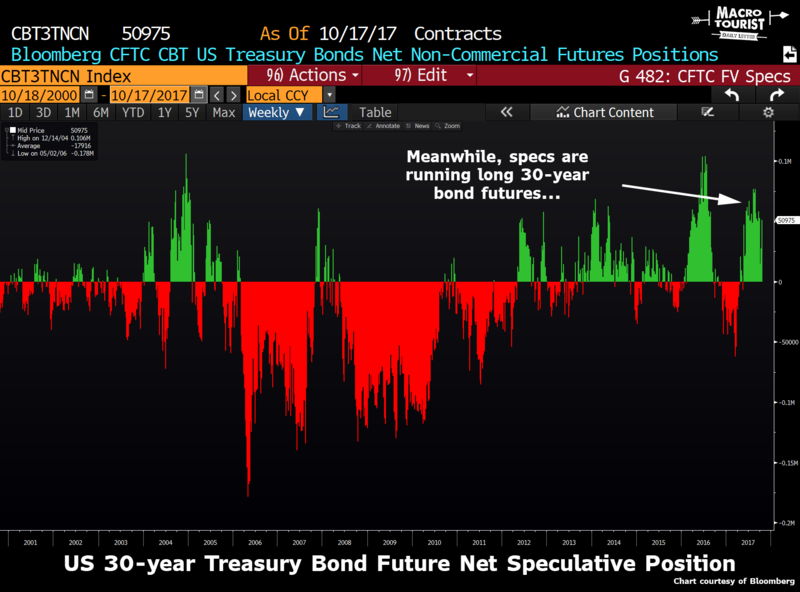 Let’s start with the speculative positioning within the US Treasury futures complex. 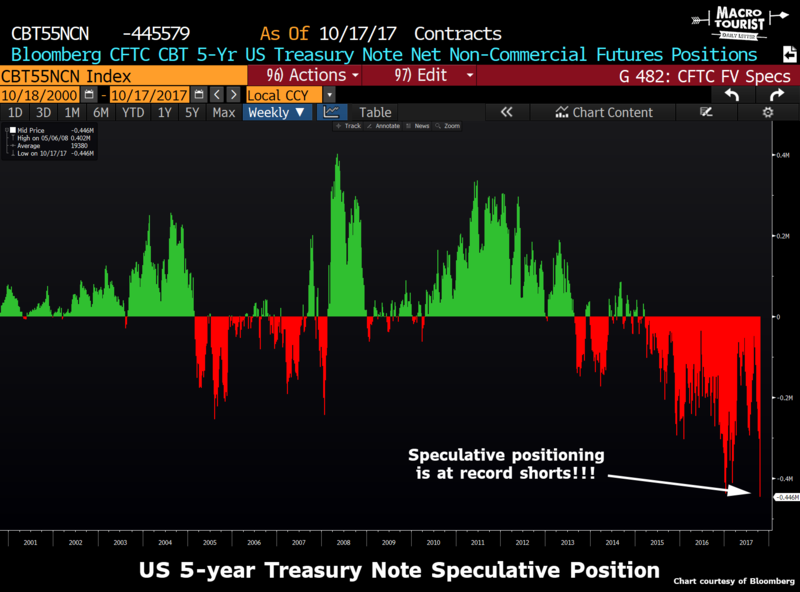 Speculators are now record short five-year treasury note futures! But the really interesting part? They are long 30-year bond futures. And they are even long the 10-year note futures. So it’s obvious the spec community has the 5-30 year flattener (or 5-10) on in size. Easy to see why. It’s been a one-way ticket. I don’t know if this is the ultimate bottom in the 5-30 year spread, but at least for a trade, it’s a great bet down here. Anytime the hedge fund crowd of wise guys become this sure of any trade, it’s time to write a ticket fading them. Remember, the new reality is that the market is nothing more than a Series of Rolling Mini-Bubbles. Flattener trades are by no means immune to this phenomenon. And the real kicker? 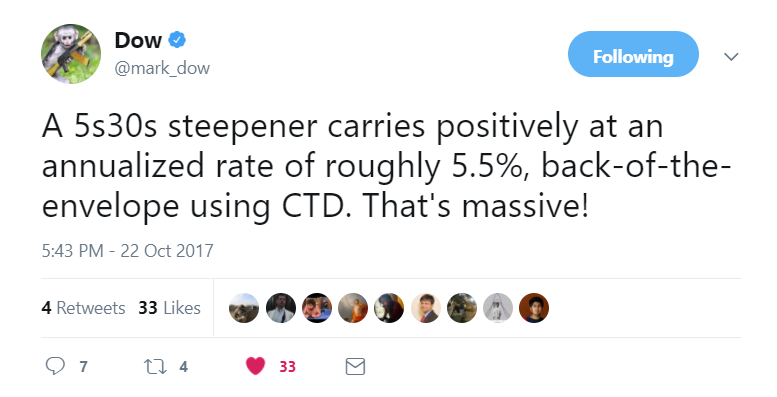 The steepener is a positive carry trade. The always enlightening hedge fund manager Mark Dow recently had a great exchange on twitter about the carry on the 5-30 steepener trade (click here if you want to be taken to the twitter thread). Now there is some debate about measuring the carry on a steepener trade. Basically, it comes down to the fact that to get the position balanced so that one basis point change in 5-year yield equals the same as one basis point change in the 30-year yield, you need to be long many more 5-year futures. Here is the hedging ratio to get the position balanced. 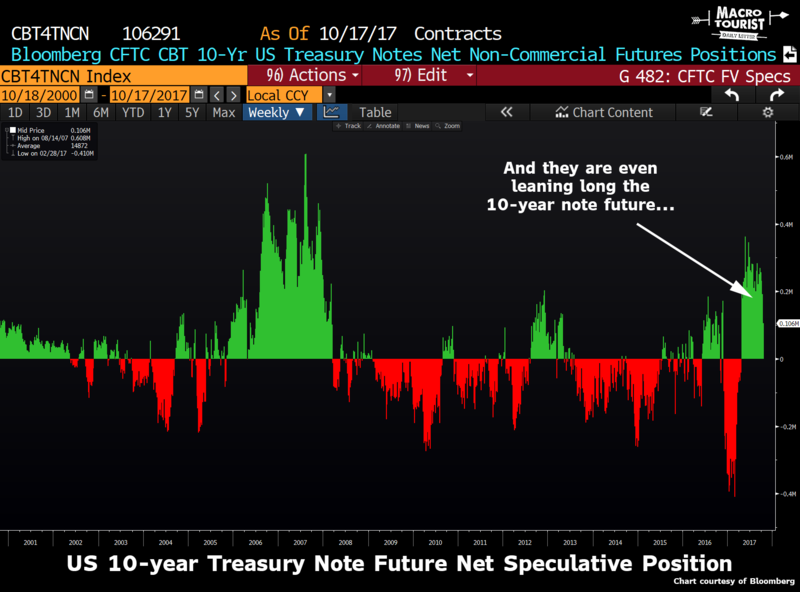 So you need 4 times as many 5-year note futures. Even though the 5-year note cheapest-to-deliver (the “CTD” that Mark referenced) yields 1.95%, which is less than the 2.577% equivalent for the 30-year future, the fact that you are long so many more five-year futures (which are yielding more than the short-term overnight rate), means you pick up more carry than you pay out. I know – boring bond stuff. I get it. The important part to realize is that if you slap this position on and nothing happens, not only do you not lose, but in fact, you pick up the carry that Mark references. And that’s the worry. A hawkish Federal Reserve Chairman appointment will flatten the curve quicker than the VIX’s recent collapse. But isn’t that why the curve is so flat? This hawkish Fed Chair risk is at least partly baked in, and provides us with the opportunity. Yet, more importantly, I am a seller that Trump puts a hawk in charge of the Federal Reserve. Say what you want about the guy, but if Trump has an area of expertise, it’s cheap credit. To think he will follow through with his campaign promise to return the Federal Reserve to an era of discipline is naive. He is tweeting everyday about the record high stock market. Do you think he wants that to end with prudent monetary policy? Not a bloody chance. Enthusiasm about the stock market is running red hot. It’s due to roll over, and when it does, the curve will steepen. Not only that, but specs are leaning way too short the curve (they have flatteners on), and if there is one thing I have learned from these past few years, the one remaining trade that still works, is fading extremes in speculative positioning. Combine all this with a positive carry trade, well, ‘nuff said. Sign me up. I am buying the steepener for a trade. PS: And just to throw this out there, many believe Janet Yellen to be a dove. Yet during her tenure, she has presided over the curve consistently flattening. What if the announcement of the end of her term marks the bottom in the trend? Auckland house prices have been rising since 2001. This is not peculiar to only Auckland, there has been a number of cities so affected. This has been fuelled from three main drivers (a) low interest rates and (b) low housing stock relative to immigration and (c) a belief that somehow, it’s different this time. The average salary of a two person household in Auckland, could be $100K, possibly slightly more, the average house price is now $1M. That is 10X your average salary. Given that interest rates are/have been at all time historical lows, an increase in interest rates could trigger massive losses and/or foreclosures. It is a bubble, I’m curious as to how much further it can inflate. The bounce in Treasury yields witnessed after the election of Donald Trump is now decaying in the D.C. swamp. If the Federal Reserve continues to ignore this slow growth and deflationary signal from the bond market and continues along its current rate hiking path, the yield curve will invert by the end of this year and an equity market plunge and a recession is sure to follow. An inverted yield curve, which has correctly predicted the last seven recessions going back to the late 1960’s, occurs when short-term interest rates yield more than longer-term rates. Why is an inverted yield curve so crucial in determining the direction of markets and the economy? Because when bank assets (longer-duration loans) generate less income than bank liabilities (short-term deposits), the incentive to make new loans dries up along with the money supply. And when asset bubbles are starved of that monetary fuel they burst. The severity of the recession depends on the intensity of the asset bubbles in existence prior to the inversion. The Fed has traditionally controlled overnight lending rates between banks. That all changed when the Fed started to buy longer-term Treasurys and mortgage backed securities as a result of the Great Recession. Nevertheless, outside of these quantitative easing programs, the long end of the yield curve is primarily influenced by the inflationary expectations of investors. The yield curve inverts when central banks believe inflation is headed higher; but bond investors are convinced of the opposite. The last two times the yield curve inverted was in the years 2000 and 2006. The inversion and subsequent recession that began in the year 2000 caused NASDAQ stocks to plummet 80 percent. The following inversion caused the Great Recession in which the S&P 500 dropped 50 percent and, according to the Case/Shiller 20-City Composite Index, home prices fell over 30 percent. This next inversion will occur in the context of record high equity, real estate and bond market valuations that will require another government bailout. However, this time around the recession will commence with the balance sheets of the Fed and Treasury extremely overleveraged right from the start. As you can see from the chart below, if the 10-year note yield (orange line) continues to fall along its current trajectory; and the Fed plods along with its avowed plan to hike the federal-funds rate (blue line), the yield curve should invert around the end of 2017. Market chaos and another brutal recession should soon follow. What could prevent this baneful scenario from happening? One of the most popular Wall Street myths is that long-term interest rates rise simply because the Fed is raising the federal-funds rate. This normally occurs because the central bank is trying to catch up to rising inflation and is initially behind the curve. However, later on in the tightening cycle long rates begin to decline as inflation is stamped out of the economy. For example, from June 2004 thru June 2006 the Fed raised the fed-funds rate from 1 percent-5.25 percent; but the 10-year note only increased from 4.7 percent-5.2 percent. That means the benchmark note went up just 50 basis points even though the fed-funds rate was raised by 425 basis points. What is especially notable here is that GDP growth was well above 3 percent in both 2005 and 2006; as opposed to today’s environment of 1.6 percent GDP growth for all of 2016, and just 1.2 percent in the first quarter of 2017. The fear of recession and deflation is the primary reason why the 10-year note yield is currently falling. The Fed has been tightening monetary policy since it started to taper its $80 billion per month quantitative easing program back in December 2013. It has subsequently raised rates three times and is now most likely already ahead of the curve due to the anemic state of the economy. But, as always, the Fed fails to read the correct economic indicators and is now fixated on the low unemployment rate and its dubious effect on inflation. Some argue that the yield curve won’t invert if economic growth stalls because the Fed will then truncate its rate hike path. And indeed there is a lot of evidence for the second quarter recovery narrative to be proven false. For instance, April data on existing home contract closings declined 2.3 percent month over month, to a 5.57 million annual rate versus a forecast of 5.65 million. And new homes weren’t much better as single family home sales declined 11.4 percent to 569,000 annualized vs. the 610,000 forecast. Pending home sales also disappointed falling 1.3 percent. Then we had durable goods falling 0.7 percent, and core capital goods orders showed no growth at all. These data points highlight the reality that the second quarter will not spring higher from the anemic first quarter growth rate. But the problem is that the fed-funds rate is already close to 1 percent. Therefore, even if we get just two more hikes before the Fed realizes growth is faltering, that rate will be near 1.5 percent. If the economy slows enough that even the Fed takes notice, the 10-year note yield should retreat back to where it was in July of 2015 (1.35 percent). In this second scenario, the yield curve inverts despite the Fed’s failure to consummate its dot plot plan. Of course, there is a small chance that the yield curve doesn’t invert due to an aggressive reverse QE program — a very quick unwinding of the Fed’s $4.5 trillion balance sheet. While this may avoid an inversion of the yield curve, it would also siphon off capital from the private sector, as investors divert yet more money to the Treasury. An aggressive selling of the Fed’s balance sheet is a very unlikely scenario given the minutes of the May Federal Open Market Committee meeting. In that meeting the Fed decided to merely taper the re-investment of its balance sheet, which is the pace in that it stops reinvesting its assets. With a total debt to GDP ratio of 350 percent, this third scenario has very low odds of occurring; but should remand the economy into a recession even if such a plan is deployed. Therefore, the only rational way to avoid an inverted yield curve, market chaos and a recession is if long-term Treasury yields reverse their long-term trend lower due to a rapid increase in GDP growth. This would only occur if Trump’s agenda of repatriation of foreign earnings, tax cuts and infrastructure spending is imminently adopted. But the probability of this happening very soon is getting lower by the day. An inverted yield curve will lead to market disorder as it did in 2000 and 2006. But this next recession starts with our national debt over $20 trillion dollars and the Fed’s balance sheet at $4.5 trillion. 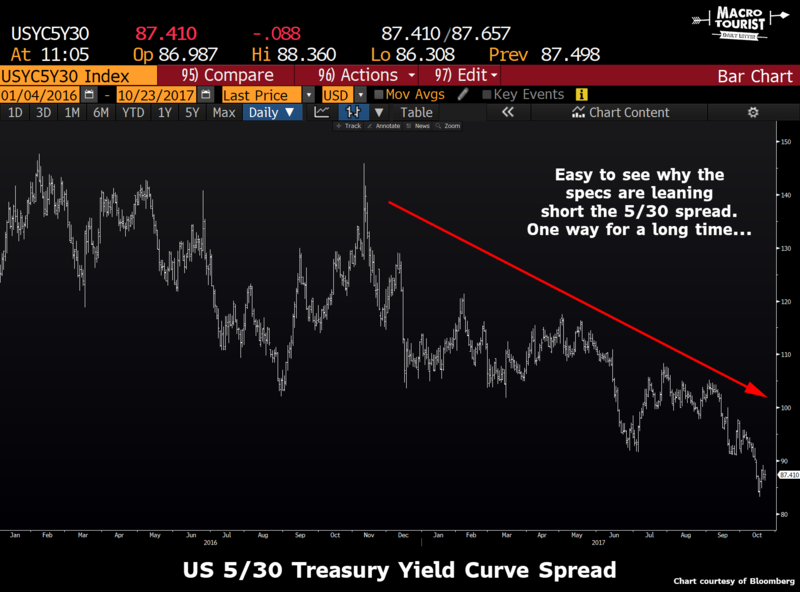 Therefore, when the yield curve inverts for the third time this century, you can expect unprecedented chaos in markets and the economy to follow shortly after. This is because the yield curve will not only invert at a much lower starting point than at any other time in history but also with the Fed and Treasury’s balance sheets already severely impaired. There will be unprecedented volatility between inflation and deflation cycles in the future due to these factors. This represents a huge opportunity for those that can identify these inflection points and know where to invest. To be more specific, sell your long positions and get short once the curve inverts; and then be prepared to hedge against inflation when the Fed responds with helicopter money. For all the talk about how the Federal Reserve has finally decided to pick up the pace of interest-rate increases, the fact is that real rates — or those after taking into account inflation — are not only still negative, but getting even more negative. Normally, that’s not such a bad thing if the goal of a central bank is to spur growth and the price of assets. But the problem now is that negative rates have weighed on the dollar, which is helping to push asset prices to or close to record highs. Although global economic growth is picking up, it’s nowhere near levels that would justify such valuations. If history is any lesson, then investors might want to study the 1970s, when the Fed responded to similar conditions by stepping up the pace of rate hikes in an effort to cause real rates to turn positive. The period from mid-1976 through March 1978 wasn’t a very good time for stocks and riskier assets in general. According to Irving Fisher, the early 20th-century economist who is credited with creating the “monetarism” school, when inflation expectations are stable, nominal rates approximate real interest rates. Lately, though, inflation expectations have crept lower, as shown by short-maturity inflation break-even rates falling by 40 basis points after the Fed boosted rates for the second time in three months on March 15. Japan is an example where inflation expectations became unstable and the Fisher relationship broke down. More recently, Europe and the U.S. have seen volatility in inflation expectations to the extent that Fisher relationships are on the cusp of breaking down for them, too. The consequence is that U.S. and European real interest rates could stay negative, and that may loosen financial conditions even more, cause the dollar to weaken, and spark capital outflows. I and others however, have for several years now, suggested that the primary problem lies with zero/negative interest rates; that not only do they fail to provide an “easing cushion” should recession come knocking at the door, but they destroy capitalism’s business models — those dependent on a yield curve spread or an interest rate that permits a legitimate return on saving, as opposed to an incentive for spending. They also keep zombie corporations alive and inhibit Schumpeter’s “creative destruction” which many argue is the hallmark of capitalism. Capitalism, almost commonsensically, cannot function well at the zero bound or with a minus sign as a yield. $11 trillion of negative yielding bonds are not assets — they are liabilities. Factor that, Ms. Yellen into your asset price objective. You and your contemporaries have flipped $11 trillion from the left side to the right side of the global balance sheet. In the process, you have deferred long-term pain for the benefit of short-term gain and the hopes that your ancient model renormalizes the economy over the next few years. It likely will not. Japan is the petri dish example for the past 15 years. Other developed market economies since Lehman/2009 are experiencing a similar fungus. Investors should know that they are treading on thin ice. The problem with Cassandras, such as Gross and Jim Grant and Stanley Druckenmiller, among a host of others, is that we/they can be compared to a broken watch that is right twice a day but wrong for the other 1,438 minutes. But believe me: This watch is ticking because of high global debt and out-of-date monetary/fiscal policies that hurt rather than heal real economies. Sooner rather than later, Yellen’s smooth shot from the fairway will find the deep rough. James Grant, Wall Street expert and editor of the investment newsletter «Grant’s Interest Rate Observer», warns of a crash in sovereign debt, is puzzled over the actions of the Swiss National Bank and bets on gold. From multi-billion bond buying programs to negative interest rates and probably soon helicopter money: Around the globe, central bankers are experimenting with ever more extreme measures to stimulate the sluggish economy. This will end in tears, believes James Grant. The sharp thinking editor of the iconic Wall Street newsletter «Grant’s Interest Rate Observer» is one of the most ardent critics when it comes to super easy monetary policy. Highly proficient in financial history, Mr. Grant warns of today’s reckless hunt for yield and spots one of the biggest risks in government debt. He’s also scratching his head over the massive investments which the Swiss National Bank undertakes in the US stock market. About James GrantJames Grant, financial journalist and historian, is the founder and editor of «Grant’s Interest Rate Observer», a twice-monthly journal of the investment markets and must read for financial professionals. A former Navy gunner’s mate, he earned a master’s degree in international relations from Columbia University and began his career in journalism in 1972, at the Baltimore Sun. He joined the staff of Barron’s in 1975 where he originated the «Current Yield» column. Mr. Grant is the author of several books covering both financial history and biography. His latest book, «The Forgotten Depression: 1921 – The Crash That Cured Itself», was published at the end of 2014. Mr. Grant is a 2013 inductee into the Fixed Income Analysts Society Hall of Fame. He is a member of the Council on Foreign Relations and a trustee of the New-York Historical Society. He and his wife live in Brooklyn. They have four grown children.Jim, for more than three decades Grant’s has been observing interest rates. Is there anything left to be observed with rates this low? Interest rates may be almost invisible but there is still plenty to observe. I observe that they are shrinking and that the shrinkage is causing a lot of turmoil because people in need of income are in full hot pursuit of what little of yields remains. What are the consequences of that? It reminds me of the great Victorian English journalist Walter Bagehot. He once said that John Law can stand anything but he can’t stand 2%, meaning that very low interest rates induced speculation and reckless investing and misallocation of capital. So I think Bagehot’s epigraph is very timely today. John Law was mainly responsible for the great Mississippi bubble which caused a chaotic economic collapse in France in the early 18th century. How is the story going to end this time? It will turn out to be very bad for many people. If Swiss insurance and reinsurance executives are reading this right now they might be rolling their eyes and they might be frustrated to hear an American scolding from a distance of 3000 miles about the risk of chasing yield. After all, if you’re in the business of matching long term liabilities with long term assets you have little choice but to wish for a better, more sensible world. But you have to take the world as it is and today’s world is barren of interest income. The fact is, that these are very risk fraught times. Where do you see the biggest risks? Sovereign debt is my nomination for the number one overvalued market around the world. You are earning nothing or less than nothing for the privilege of lending your money to a government that has pledged to depreciate the currency that you’re investing in. The central banks of the world are striving to achieve a rate of inflation of 2% or more and you are lending certainly at much less than 2% and in many cases at less than nominal 0%. The experience of losing money is common in investing. But where is the certitude of loss even before your check clears? That’s the situation with sovereign debt right now. On a worldwide basis, more than a third of sovereign debt is already yielding less than zero percent. There is not quite a bestseller, but a very substantial book called «The History of Interest Rates». It was written by Sidney Homer and Richard Sylla. Sidney Homer is no longer with us, but Richard Sylla is alive and well at New York University. So I called him and said: « Richard, I’ve read many pages but not every single page in your book which traces the history of interest rates from 3000 BC to the present. Have you ever come across negative bond yields?» He said no and I thought that would be kind of a major news scoop: For the first time in at least 5000 years we have driven interest rates below the zero marker. I thought that was an exceptional piece of intelligence. But I notice however that nobody seems to have picked up on it. It’s now already two years ago since the ECB was the first major central bank to introduce negative rates. There are some other historical settings: In Europe, Monte dei Paschi di Siena, this 500 and plus year old bank in Italy, is struggling and as broke as you can be without being legally broke. Monte dei Paschi has survived for half a millennium and now it is on the ropes. Meanwhile, the Bank of England is doing things today that it has never done in its history which is 300 plus years. So I suggest that these are at least interesting times and in many respects unprecedented ones. So what’s the true meaning of all this? In finance, mostly nothing is ever new. Human behavior doesn’t change and money is a very old institution and so are our markets. Of course, techniques evolve, but mostly nothing is really new. However, with respect to interest rates and monetary policy we are truly breaking new ground. Now central bankers are even talking openly about helicopter money. Will they really go for it? I already hear the telltale of beating rotor blades in the sky. I also hear the tom-toms of fiscal policy being pounded. There seems to be some kind of a growing consensus that monetary policy has done what it can do and that what me must do now – so say the «wise ones» – is to tax and spend and spend and spend. That seems to be the new big idea in policy. In any case, it is not good for bondholders. Interestingly, nobody seems to be talking about the growing government debt anymore. Also, budget politics are just a side note in the ongoing presidential elections. The trouble with this election is that somebody has to win it. I have no use for Donald Trump but I have equally no use for Hillary Clinton. The point is that one of those two is going to win. That is the tragedy! So we at Grant’s regret that one of them is going to win. The financial crisis and the weak economic recovery likely have spurred the rise of Donald Trump. Why isn’t the US economy in better shape after all those monetary programs? I wonder how it would have been if markets had been allowed to clear and if prices had been allowed to find their own level in real estate in 2008. Central banks have intervened to quell financial panics for at least 200 years. For instance, in 1825 the bank of England lent without stint and was not – as they said – overnice about the kind of collateral. That was a very dramatic intervention. So it’s not as if we have never before seen the lender of last resort at work. But what is new is the medication of markets through this opiate of quantitative easing year after year after year following the financial crisis. I think that this kind of intervention has not only not worked but it has been very harmful. Around the world, the economies are not responding despite radical monetary measures. To some degree, I believe, they are not recovering because of radical monetary measures. What’s exactly the problem with the US economy? There is another side of what we are seeing now: In America certainly the Federal Reserve and bank regulators generally are very heavy handed in their interventions. I’m sure they have every good intention. But with their regulatory charges they are suppressing the recovery in credit that takes place in a normal economic recovery and in this particular case after a depression or after a liquidation. Then again, a revisit of the financial crisis would be catastrophic. The new rules with respect to financial reform have absorbed not only forests worth of paper but also the time and attention of legions of lawyers. If you talk to a banking executive what you hear is that the banks have been overwhelmed by the need to hire compliance and regulatory people. This is especially bearing on the smaller banks. I think that’s part of the story of the lackluster recovery: Monetary policy has been radically open in the creation of new credit. But it has been radically restrictive with regard to risk taking in the private world. So what should be done to get the economy back on track? There are guides in history on how to do this. For more than a hundred years in Britain, in the United States and probably as well in Switzerland, the owners of the equity of a bank themselves were responsible for the solvency of the bank. If the bank became impaired or insolvent they had to stump up more capital to pay off the liability holders, including the depositors. But over the past hundred years collective responsibility in banking has gradually replaced individual responsibility. The government, with the introduction of deposit insurance, new regulations and interventions has superseded the old doctrine of the responsibility of the owners of a property. That’s why I think we need to go away from government intervention and go more towards market oriented solutions such as the old doctrine of responsibility of the bank owners. At least in the US, the Fed is trying to go back to a more normal monetary policy. Do you think Fed chief Janet Yellen will make the case for another rate hike at the Jackson Hole meeting next week? Janet Yellen is by no means an impulsive person. According to the « Wall Street Journal», she arrives for a flight at the airport hours early – and that’s plural! So this is a most deliberative and risk averse person. Also, as a labor economist, she’s a most empathetic person. She believes what most interventionist minded economists believe: They have very little faith in the institution of markets and they don’t believe that the price mechanism is anything special. They want to normalize rates and yet they can always find an excuse for not doing so. We have been hearing for years now that the next time, the next quarter, the next fiscal year they will act. So I believe what I’m seeing: None of these days the Federal Funds Rate will go higher than 0.5%. I can’t see that happening. Wall Street seems to think along the same lines. So far, many investors don’t take the renewed chatter of a rate hike too seriously. The Fed is now hostage to Wall Street. If the stock market pulls back a few percent the Fed becomes frightened. In a way I suppose, the Fed is justified in that belief because it is responsible to a great degree for the elevation of financial asset values. Real estate cap rates are very low, price-earnings-ratios of stocks are very high and interest rates are extremely low. One can’t be certain about cause and effect. But it seems to me that the central banks of the world are responsible for a great deal of this levitation in values. So perhaps they feel some responsibility for letting the world down easy in a bear market. It has come to a point where the Fed is virtually a hostage of the financial markets. When they sputter, let alone fall, the Fed frets and steps in. Obviously, the financial markets like this cautious mindset of the Fed. Earlier this week, US stocks climbed to another record high. Isn’t that a funny thing? The stock market is at record highs and the bond market is acting as if this were the Great Depression. Meanwhile, the Swiss National Bank is buying a great deal of American equity. Indeed, according to the latest SEC filings the SNB’s portfolio of US stocks has grown to more than $60 billion. Yes, they own a lot of everything. Let us consider how they get the money for that: They create Swiss francs from the thin alpine air where the Swiss money grows. Then they buy Euros and translate them into Dollars. So far nobody’s raised a sweat. All this is done with a tab of a computer key. And then the SNB calls its friendly broker – I guess UBS – and buys the ears off of the US stock exchange. All of it with money that didn’t exist. That too, is something a little bit new. Other central banks, too, have become big buyers in the global securities markets. Basically, it all started with the QE-programs of the Federal Reserve. It is a truism that central banks do this. They’ve done this of course for generations. But there is something especially vivid about the Swiss National Bank’s purchases of billions of Dollars of American equity. These are actual profit making, substantial corporations in the S&P 500. So the SNB is piling up big positions in them with money that really comes from nothing. That’s a little bit of an existential head scratcher, isn’t? So what are investors supposed to do in these bizarre financial markets? I’m very bullish on gold and I’m very bullish on gold mining shares. That’s because I think that the world will lose faith in the PhD standard in monetary management. Gold is by no means the best investment. Gold is money and money is sterile, as Aristotle would remind us. It does not pay dividends or earn income. So keep in mind that gold is not a conventional investment. That’s why I don’t want to suggest that it is the one and only thing that people should have their money in. But to me, gold is a very timely way to invest in monetary disorder. ducati998 on “Or”, Conjunctive or Disjunctive? Richard on “Or”, Conjunctive or Disjunctive?